Two gold wedding rings nestle together on this elegant ring bearing cushion. White envelopes supplied with your order. Guest Name printing is available on this design. When choosing your wording please look for the symbol below. You will see this symbol when on the "Choose Wording" step of the order process. 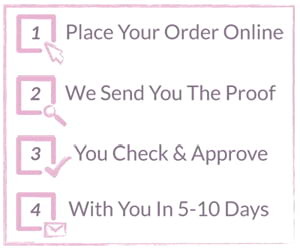 Once selected please proceed through the order process as normal and you will get to the "Guest Name Printing" screen and be able to enter your guest's details. 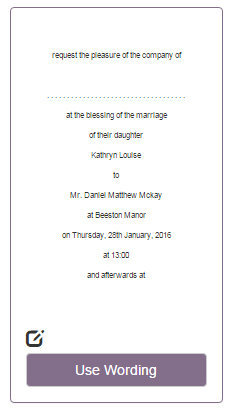 We charge 30p per invitation for Guest Name Printing. The front of this invite is personalised with your names and wedding date and has a high gloss finish. Inside will feature the details of your wedding.